Dana Point drivers are sharing the road with a new kind of vehicle. The three-wheeled Scoot Coupe is now available to rent or purchase from Pacific Coast House of Rides at 34105 Pacific Coast Highway. Manager Justin Dornan said the store bought three of the vehicles and began to rent them out for tours of the harbor last week. The Scoot Coupe has become the most rented vehicle since the store opened in late September, Dornan said. “Our whole fleet will be out for most of the day on the weekends,” he said. The vehicle, about the size of a go-cart, has the styling of a sports car but handles more like a scooter. Handlebars replace a steering wheel for controls, and the interior seats one passenger and one driver. 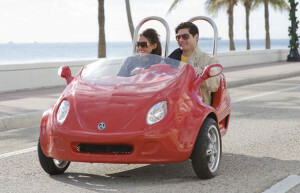 Florida-based Panther Motors began offering the Scoot Coupe in 2004, according to scootcoupe.com. Though the coupes are popular at scenic tourist destinations, Panther Motors also promotes them as commuter vehicles. The trunk can accommodate several bags of groceries, and rack attachments are available to hold bikes or kayaks. Coupes may be fueled at traditional gas stations and can travel up to 80 miles on a full tank, which holds about a gallon of gas, Panther says. Some even come with iPod docks and GPS units. Though they are classified as motorcycles under state law, a motorcycle license is not required to operate a Scoot Coupe, Dornan said. However, a helmet is mandatory – the coupes can reach speeds up to 55 mph. PCH Rides rents the vehicles for about $40 an hour, depending on the season. 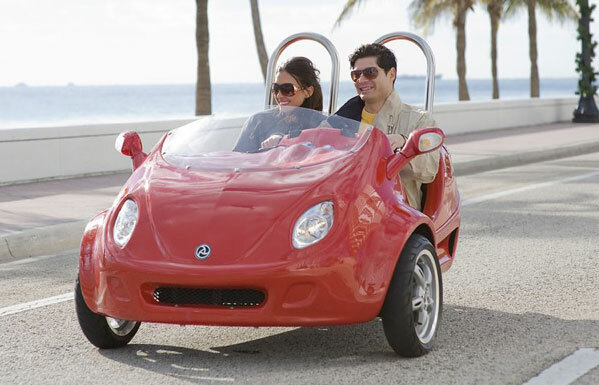 Scoot Coupes also are available for purchase for $6,000 to $7,000, depending on the engine size. The vehicles caught Dornan’s eye on a trip to Hawaii, and he saw them again in Las Vegas. He also saw an opportunity. “It was like Mario Kart in real life,” he said. He said he plans to purchase a dozen more Scoot Coupes for his rental fleet in the spring, when tourism picks up. You can reach Pacific Coast House of Rides at 949-415-4724.